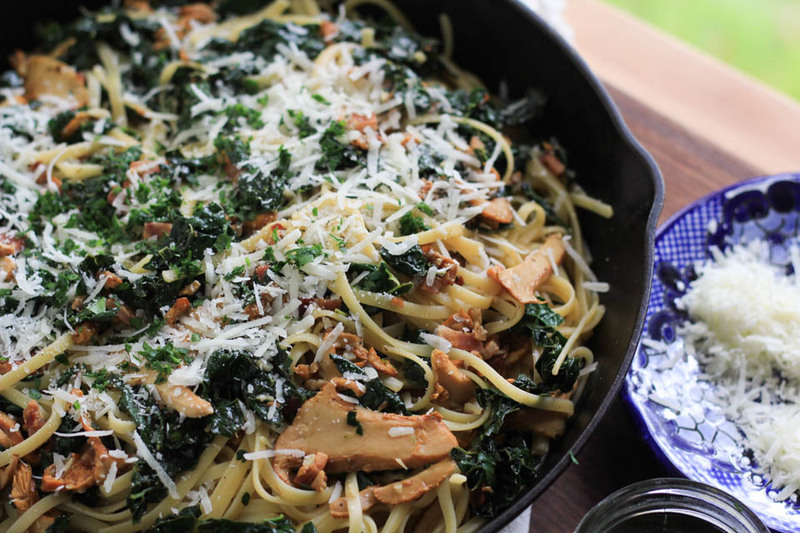 How about we start this Fall off with a super comforting new recipe on NJB! I know it’s been Fall for a few weeks, but we’ve been going and going that I didn’t have a moment to cook up a new recipe, so here it is and I’m thinking it’s a good one. Not only does it have bacon, which is great, but it’s not the star here! 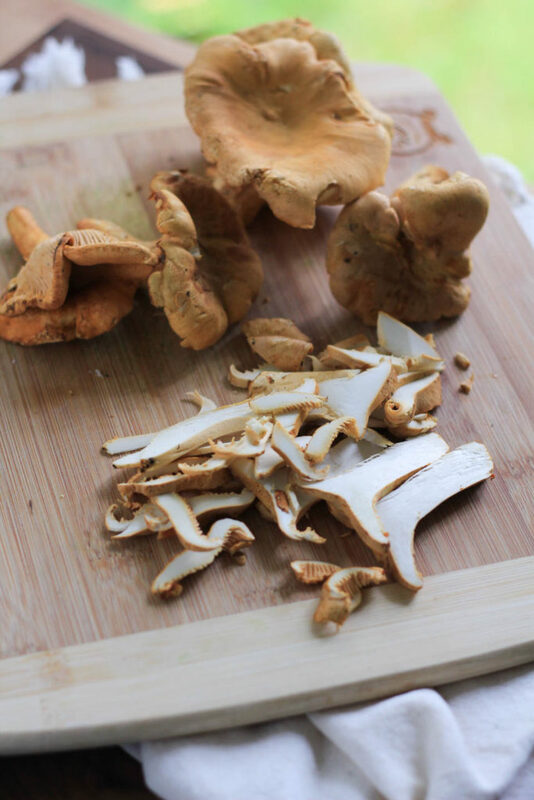 These gorgeous chanterelle mushrooms are the glory of this dish. They have a short season and making a simple quick pasta and have them be the star of the dish is the perfect way to enjoy them every year. You could totally use a different mushroom when these are not in season, because this pasta is all about mushrooms! Just swap them out for your favorite mushroom and voila, dinner. These are all simple ingredients, but treated the right way, you get an amazing dish for some much needed cold weather comfort. 1 bunch lacinto kale, stemmed, tear into medium pieces, lightly massage to soften. Cook pasta to al dente by following directions on package. Reserve 1 cup cooking water, after pasta has cooked using a ladle. In a large skillet add 1 teaspoon olive oil over medium high heat, once oil is shimmering, add slices of bacon. Cook for about 3 minutes, turn and cook about 2 minutes. Bacon should be slightly crispy but not over cooked/hard. Remove bacon and place on a paper towel to drain. Reduce heat to medium low, add mushrooms, sauté for 1 minute. Add garlic and cook 30 seconds, or until fragrant. Add 1 cup of reserved cooking pasta water to pan to de-glaze. Using a wooden spoon, scrape the bits of the bottom of the pan. Add kale, a pinch of salt and pepper, squeeze fresh lemon juice, stir to combine. Taste for seasoning, add salt and pepper if needed. Chop bacon. 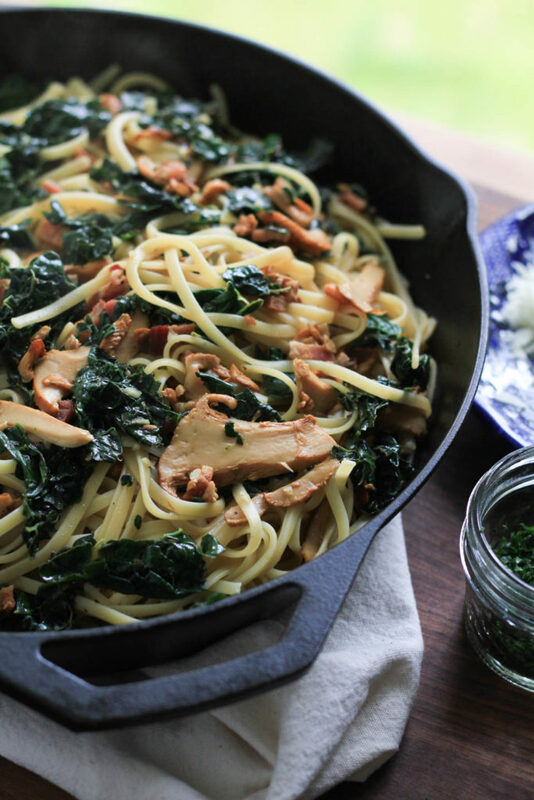 Toss linguine, 3 tablespoons olive oil, mushroom mixture, and chopped bacon together in pan. 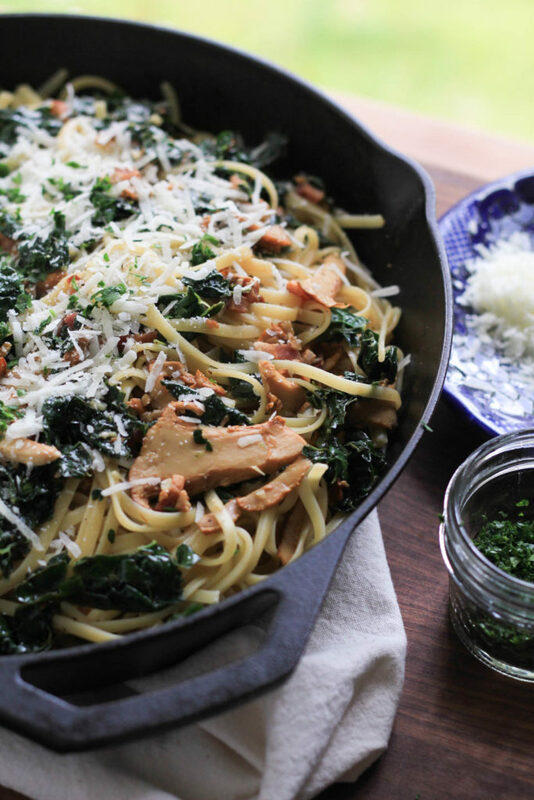 Serve immediately with a sprinkle of fresh parsley and parmigiano reggiano cheese. Store leftovers in an airtight container for up to 3 days.